This game was a wash early on. The Huskies couldn't defend, Phil Scrubb was en fuego and Carleton was locked in defensively. Carleton won 90-50. There's not much use digging too deep here, as Sask didn't seem up to task to guard anyone. The Scrubbs shouldered most of the scoring load, combining for 49 points on 19-31 shooting. It should be noted that this game felt more like a 9 a.m. tip-off for the Huskies because of the travel and time difference. That doesn't explain the 40-point disparity. Carleton's defence was good and forced Mike Scott into tough shots. Scott's selection did not put him in a spot to be successful either, but Carleton shut down their other options, so it is hard to blame the guard for shooting. Also: this game's stream until the second quarter, apparently. I only tuned in then, so I didn't notice any issues. Gotta hope stream problems get fixed since they will be charging for the semis and finals. I didn't enjoy this at all. Some were praising the game, but it wasn't great to watch. Missed shots, botched open lay-ups, inconsistent officiating. Vic had their opportunities to blow this open, missing a bunch of shots in the fourth. The McLaughlin-Tibbs pick-and-roll/pick-and-pop was effective in getting players open, but I thought that Tibbs missed McLaughlin in favour of taking his own shots sometimes. McLaughlin is an above-average three-point shooter and even though he struggled, I thought Vic could have done a better job getting him the ball, perhaps using more screens or running alternative looks. Your first-team All-Canadian needs to get more than 10 shots in 30 minutes of play. Dalhousie gave it everything they had, though. Their defence did make play tough for McLaughlin, but Ritchie Kanza Mata was the standout from my perspective. I thought he might get in the jersey of Tibbs but he surpassed those expectations, giving Tibbs little room to start dribbling or see the court. But the Tigers lacked shooting and finishing, which, as it turns out, are two very important parts of scoring the ball. They fed Kashrell Lawrence and he played well, but asking him to lead your team to victory when he's matched up with a much taller defender is stacking the deck in your opponent's favour. Lawrence even put Dal up 1 at the end with a put back. I'd argue there isn't any play on the ball here, and the real-time play suggest this too. McLaughlin made both free throws and gave them the lead. But Dal had an opportunity to win it. Six seconds left on the game clock is a decent amount of time to run something and get someone open. It ended in a contested three-point attempt from a player who averages 0.6 three-point attempts per game. Suboptimal. With that missed shot, the Tigers exit the championship-side tournament, and Vic moves on to play Carleton. Vic will need to move past this game immediately if they want to sniff the Ravens. On home court, the Rams crushed the Lancers. I was fortunate to be in person for this game and the crowd had their moments, but it wasn't the same advantage you would expect for a home team. It was a nervous optimism for a while, both in the stands and on the court. Both teams played timid, missing easy looks and making odd passes. Ryerson settled in later in the first quarter. That's a little surprising because they have the home pressure. When they got comfortable running in transition, Windsor wavered and you could feel the Rams's confidence rising. I speculated in my preview that Adika Peter-McNeilly could provide for the Rams, and provide he did. He rebounded well, made good decisions and showed a lot of poise for someone in their first nationals game. Windsor tried to crash the glass. They had their fair share of offensive rebounding opportunities because they only shot 36.6% from the floor, but Ryerson locked things down. Peter-McNeilly led the team with ten boards, all on the defensive end. You could see the result coming after the first quarter, where Windsor only scored 10. They put up a fight, but at the end of the season, with another game under their belt because of playoffs, the team just didn't have the roster depth to keep up. Khalid Abdel-Gabar got in foul trouble and without a lead guard, the Lancers floundered. The team strayed from their offence, playing in emergency-mode for a decent amount of time. Shots were both contested and rushed because of the deficit. Now, I thought Ryerson wasn't using a ton of on-ball screens. This is key because of Windsor's desire to switch all screens. Instead of pick-and-roll, the Rams relied on off-ball plays to free up a player and allow that player to attack the defender who should be unsettled. It worked well, as the Rams drove to finish at the rim or initiate contact. I don't think Windsor is as bad as this game showed. However, they were screwed by the dated seeding rules. Yes, you have to beat the great teams to win, but you should be rewarded with an easier opponent if you are the No. 2 seed. This is logical stuff. If you're reading this, it's too late: for all intents and purposes, Windsor's tournament is over and they'll lose two key players (Khalid Abdel-Gabar and Evan Matthews). I'd argue those are their thinnest positions too. It is gutting for me to write about this. I just feel brutal for the Bishop's team, players and fans. But the purple-clad fans won the hearts of the casual observers and it pushed the players a bit more. Bishop's pushed up on screens, trying to take the ball out of the dribbler's hands. This isn't a great strategy because of Ottawa's ability to swing the ball to open players, but it worked for a few reasons. 1) Ottawa didn't fully move the ball. They would make passes, but it would stick a bit and shots were forced. 2) Ottawa couldn't hit their open shots. This was a trend, as the Gaiters and Ravens were the two teams to really hit from behind the arc. That Bishop's hit well from 3 is a surprise because they shot 27.9% from the land beyond this season. That's 42nd out of 47 teams. 10 made threes was a season-high for the Gaiters. 3) Bishop's had clean rotations. I slammed their defensive rating a bit in the preview, and I stand by what I said, but they did play very well and closed out well. If you're going to play that pick and roll defence, you need smart, quick players. From one game, it looks like Bishop's had it. Now, Bishop's offence wasn't convincing either. But they crashed the glass hard and bailed out stagnant possessions. For those keeping score, in two of the past three games, Ottawa has been hammered on the glass. What did the Gaiters in was the fouling out of Kyle Desmarais. Had he stayed in, I think the final two minutes wouldn't have been laden with turnovers and poor passes. But Ottawa attacked him and got him out of the game. His exit led to the key play of the game; a Caleb Agada steal and a crucial block/charge call that put Agada on the line. That's a tough call to make. There was no sense of control from the Gaiters though. They were hanging on in the final minutes and I don't think a ref would have much confidence this after watching Bishop's come apart. I do think it was a block. 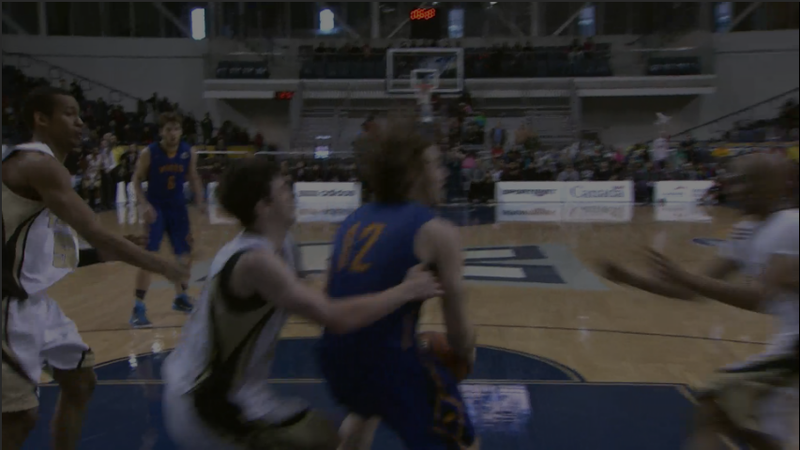 Paused at the 20 second mark, you can see the Gaiter player going down and leaning in to get contact. He also made a play to get the loose ball, so I doubt he was bracing to take a charge and be in position. So, Agada hit both free throws and the Gaiters ran nothing with 10.5 seconds left. The shot was just a huck, and I think that play is as important as the block/charge. We can question the refs, but Bishop's final play execution, or lack thereof, deserves criticism too. I thought that if the Gaiters didn't make a shot after Agada's free throws, Ottawa would run away in OT. That's exactly what happened. Ottawa escapes and have a lot of questions that need answers. James Derouin says they'll keep shooting. I agree with that, but I think rebounding is what they need to emphasize. Bishop's put up a fight and for that, they deserve serious, honest credit. They played well, hit open shots and should have won. Any kind of discussion about where RSEQ basketball falls in the CIS hierarchy is premature. This is one game. Bishop's put up a fight against Windsor too, but lost. The disparity between Quebec teams and those contending for a national championship may not be as big as we think, but to say it doesn't exist is massive leap given the decade-long CIS tournament drought and this year's weak non-conference play. Bring on the championship games. Could be one of the best semifinal/final we've seen in a while.